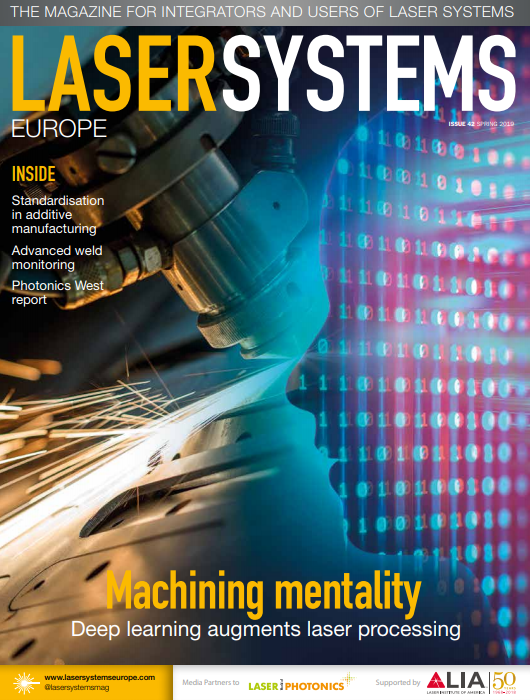 Fibre lasers are dominating the material processing market right now, but many metals only absorb partially in the 1µm wavelength emitted by solid-state lasers. Now, high-power diode laser systems are beginning to be released based on blue laser diode technology, at which wavelength pretty much all metals have higher absorption. Industrial blue laser diode systems from US firm Nuburu and Japanese company Shimadzu were exhibited for the first time at SPIE Photonics West in San Francisco early in the year – Nuburu was a finalist for a Prism Award at the event. In addition, Laserline presented work at the conference from the German-funded Blaulas project, which is developing high-power CW blue laser diode bars. Gallium nitride, the material blue laser diodes are made from, is manufactured in large volumes for displays and illumination, but only now has it matured to a point where it can be used for material processing, according to Jean-Michel Pelaprat, co-founder of Nuburu. At Photonics West, Nuburu showed a 150W blue diode laser module, the AO-150, which it launched in 2017, while Shimadzu was exhibiting 100W modules. Nuburu also gave a scientific presentation during the high-power laser session at the show, reporting a prototype device with 730W of blue laser power. Nuburu intends to launch a 500W laser late this year, and the company has a roadmap to go to multi-kilowatt power levels, Pelaprat said. Nuburu’s technology combines single gallium nitride diodes from Osram Opto Semiconductors with micro lenses; multiple diode beams are collimated into a single beam, which is then coupled inside an optical fibre. ‘The technology around the micro optics, the fast axis and slow axis collimators, and the macro optics to combine this into a fibre, is where a large part of the knowhow of Nuburu resides,’ Pelaprat said. Meanwhile, Laserline presented work at Photonics West on a 700W fibre-coupled CW diode laser, operating at 450nm with 60mm mrad beam quality. These are results from the first two years of the three-year Blaulas project, which aims to build a kilowatt blue diode laser. Osram, Coherent-Dilas and the Max Born Institute are all partners. Yellow metals benefit most from processing with blue laser diodes because of higher absorption at 450nm versus absorption at 1µm – gold is more than 100 times more absorbing in the blue than the infrared. But processing copper is where the blue laser could come into its own. The metal has 65 per cent absorption in blue wavelengths versus 5 per cent in the infrared, 13 times higher absorption. Aluminium is three times better absorbing – 15 per cent in the blue compared to 5 per cent for infrared – while stainless steel is only 50 per cent higher for blue compared to infrared. ‘At low power, some of our customers using the laser for copper welding applications have reported a speed increase of eight to ten times versus infrared lasers,’ reported Pelaprat. 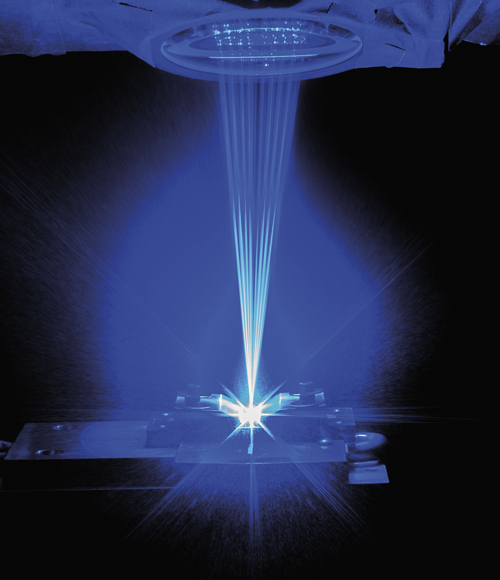 Most applications that would use blue diode lasers are for welding at the moment, largely because of the lower beam quality compared to fibre or disk lasers. Nuburu is focusing on copper processing at the moment. The first application it is targeting is for welding copper foils in lithium ion batteries. Inside a battery cell for a car, there are multiple copper foils on the cathode side interleaved with aluminium foils on the anode side. It is crucial to join the copper foils with a high-quality weld. Joining copper foils is carried out today mainly by ultrasonic welding. This is a contact tool with a complex geometry, so only a certain type of joining can be achieved. Ultrasonic welding also generates particles, which can contaminate the battery cell. ‘People are looking for a solution that will give defect-free, contactless welding,’ Pelaprat said. Using blue laser light creates a defect-free weld with low thermal impedance, which reduces the temperature rise inside the weld. The blue laser also minimises the intermetallic when joining dissimilar metals, such as copper to aluminium, which increases the mechanical strength of the weld. The intermetallic is a brittle alloy generated at the junction between copper and aluminium when welding with an infrared laser. There are different approaches to building high-power direct diode lasers, according to Ullmann. One is to use single emitters, which in the near infrared might emit 10-15W of laser light, and combined will give a few hundred watts of power. The other approach is a diode bar, typically a 10mm-long chip that produces around 200-250W output power in the infrared. The same methods can be used with blue diode lasers: blue single emitters have an output power of 3-5W, while the bar concept can produce 50W per bar, Ullmann said. Laserline bases its technology on stacked diode bars with actively cooled heat sinks. Combining eight 50W bars, for example, will give 400W output power from a stack. The laser light is combined by polarisation coupling, among other methods. Coherent-Dilas is working with its T-bars as a partner in the Blaulas project. The firm’s core competence is building high-power diode lasers from monolithic multi-emitter bars. Their expertise is in bar mounting, which involves proper cooling designs and material selection, beam shaping for collimation, and coupling the light into a fibre. Lenhardt added that one of the targets for the Blaulas project is to achieve homogeneous blue diode wafers, so bars can be cleaved from the material, and not only single emitters. Nuburu’s direct diode blue laser has a brightness of 20mm mrad, which is not an issue for welding, noted Pelaprat. The beam quality, however, means that ‘this particular laser, at this stage, is not yet ready for cutting applications or some of the powder bed applications,’ he said. The AO-150 and the 500W version will be suitable for welding, brazing and laser metal deposition.